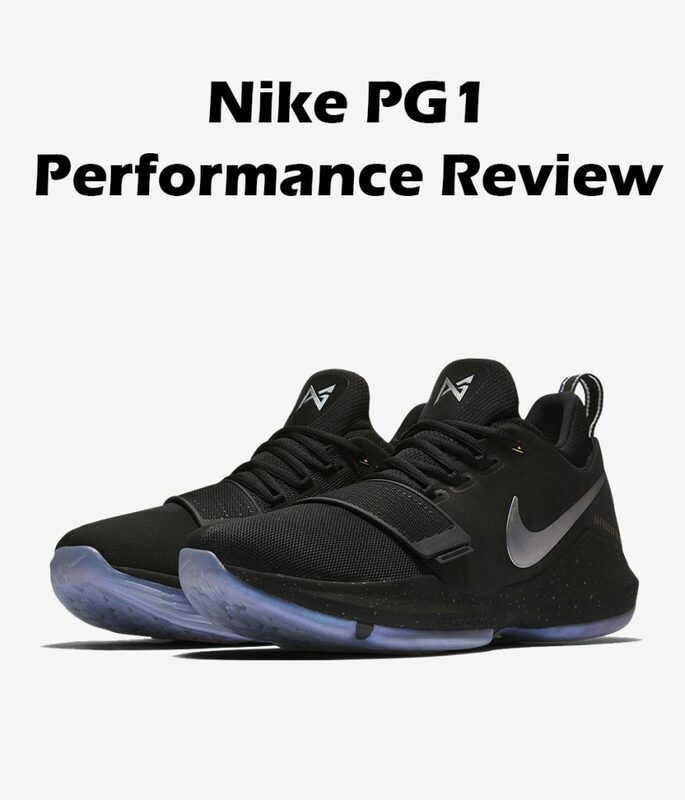 Nike PG1 PERFORMANCE REVIEW – Cop or Drop? The forefoot area of the shoe is covered with mesh. As we all know, mesh is very soft material so it gives you very comfortable fit with zero restriction for your natural feet movements. On top of that, we have a layer of fuse in high wear areas to protect mesh from going apart. Now, the back is covered with nubuck. I think Nike made a perfect choice for putting these materials. Nubuck is more rigid and more supportive material than mesh and it’s exactly how you want it to be in the heel area. In result, you are getting a perfect combo: comfortable, flexible and unrestricted fit in the forefoot and supportive, more durable materials in the heel area. 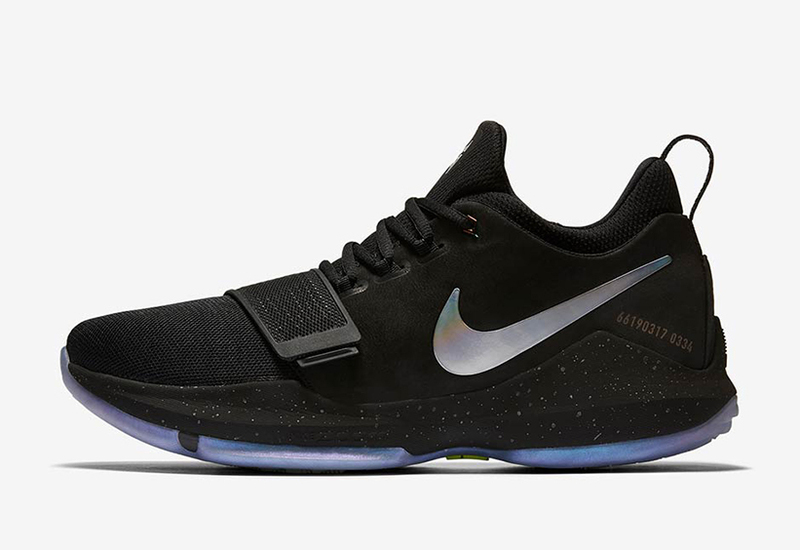 The Nike PG 1 has forefoot Zoom Air unit and the rest of the heel is covered with Phylon. Nothing too crazy but it gets the job done really well, no complains. The best aspect of the Zoom Air unit is responsiveness. During my performance test, I was able to make quicker first steps. This is very crucial for guards. In addition, we’re getting decent court feel and impact protection to go with. If you are looking for bouncy and soft cushion tooling then you should look somewhere else. For bouncy cushion I recommend the adidas Crazy Explosive. However, guards and smaller players will find these as a perfect fit for them. 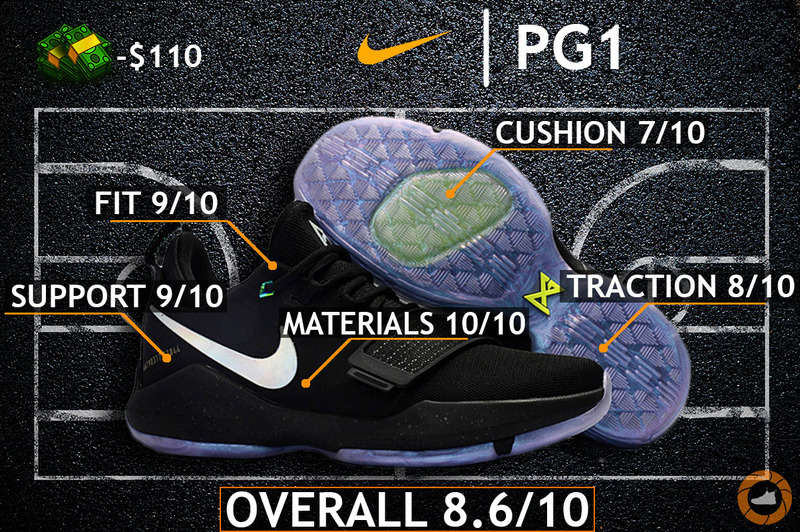 The PG1 features a translucent rubber with weird looking directional pattern. This traction performed well for me. On clean courts traction was great, no major slippage problems and solid grip with the floor. I was able to do quick moves and stops without any problems. Although, I know that this traction will be better in upcoming non-translucent rubber colorway. So, if your main priority on-court is traction then I recommend you to wait for upcoming colorways with traditional rubber. On dirty court the PG1 performed surprisingly decent. Maybe the court where I played was not so dirty. Nah… I’m just kidding. Traction was able to perform at the same level as on the clean court, amazing sh*t. Of course, you will need to wipe them here or there to maintain that solid grip with the floor. 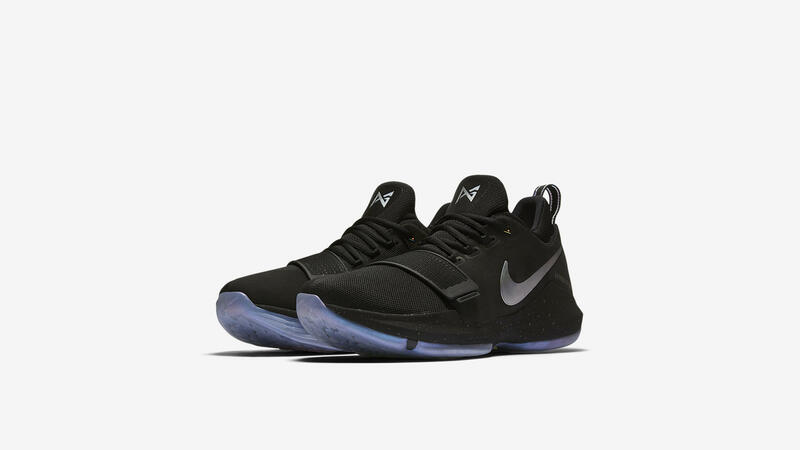 For outdoor ballers I recommend to wait for traditional rubber colorway of PG1 too, because translucent rubber compound is too weak for outdoor bball. Oh man! One of the most comfortable shoe I have ever reviewed! Now doubt this is the main reason you should try them. They have one piece bootie construction, that’s why it offers perfect fit. I’m a wide footer so I went with half a size bigger pair and it worked perfectly. Now, if you have regular size feet, I recommend you to simply go true to size for that snug and custom fit. The midsole is another feature that I like. At some point it was very similar feel to the Dame 3, because of that high midsole on inner side. Your foot just falls in footbed and gives incredibly amazing lockdown feel and great stability, huge fan of that. Also, the strap in forefoot area is just another great addition to already superb containment and comfy fit. We have the internal heel counter and that’s about it. It seems weak, right? Maybe it sounds weak but actually they got a lot to offer. As I said previously, rigid and stiff nubuck on heel area will provide you with nice and secure feel. In addition, the high midsole nicely wraps around your foot and keeps it secure in footbed. I had no complains about support system in these- really solid lockdown even for a big guy like me. If you a big fan of wearing ankle braces then you should go up ½ size since the fit is very snug and it doesn’t have additional space for something like this. But I think that the PG1 has enough support to keep your feet safe and secure in all situations on-court, so in this case an ankle brace is no very useful. I can’t say that the Nike PG1 is one of the best shoes out here but it’s almost there, just a few inches behind. However, I really enjoyed doing performance review on them, they just so fun to play in. Personally, the only down side for me was the cushion setup, just because I’m a heavy player that needs cushion in the heel area. 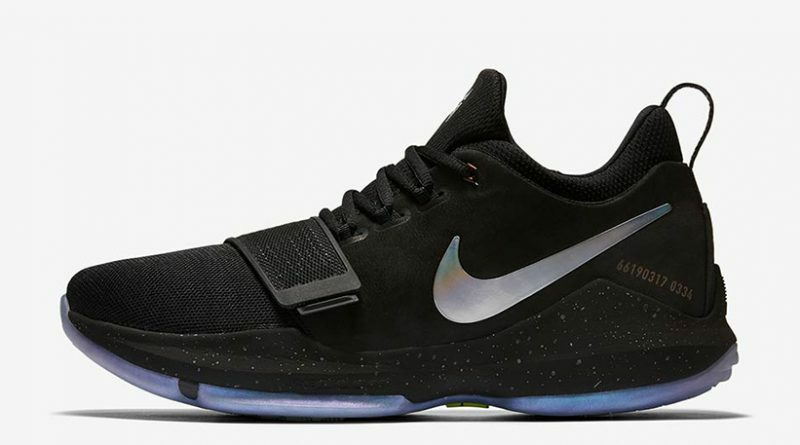 If Nike will add heel Zoom Air unit or maybe even the full length cushion tooling in the next PG signature shoe, then we will definitely have another great all-around sneaker. Light and small players will enjoy every minute in these due to perfect, one-to-one fit, great forefoot cushion, A+ support and solid court feel. For $110 dollars I just can’t see any reason to not to buy them, especially if you’re a smaller guy, definitely a cop for me. 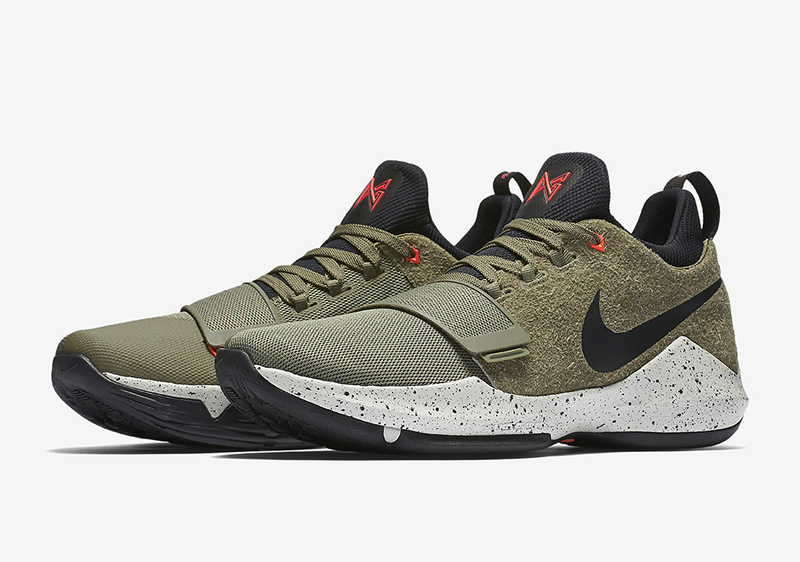 What do you guys think about the new Nike PG1? Did you cop them? Comment bellow! ← Nike LeBron 14 PERFORMANCE REVIEW – Is It Worth Buying? Are you play basketball? You see, basketball shoes has completely different cushion setups then lifestyle sneakers, so maybe that’s why you don’t see any differences. Is the forefoot zoom noticeable? I’m a forefoot striker, so i need cushion in the forefoot. And can you suggest shoes with good forefoot cushioning? Thanks. It heavily depends on how heavy you’re. For smaller dudes this zoom unit is just simply too firm & small to make any differences. But bigger players will definitely find the forefoot section effective in terms of cushion. So if you need that perfect blend between responsiveness and cushion, I would recommend you going with BOOST – CRAZY EXPLOSIVE ’16 or ’17 and if it’s to bouncy for you, the Harden Vol.1 might be the best way to go. And if adidas doesn’t float your boat then you can easily go with the KD 9 or 10 or with more expensive option – the Jordan 32. So yeah, the selection is pretty damn wide. I’m a light shooting guard and these kicks were perfect for me cause of the perfect fit and lockdown. Also the forefoot cushioning was very responsive and helped make quicker steps and transitions. The price was crazy cheap for a signature shoe. Thanks for the awesome review because it helped me make an awesome decision. Super super happy for you man! Glad I was able to choose the perfect pair. Keep making buckets! The pg 1 and pg 2 has the same rating why? Why does later reviews dosen’t have the score board anymore. Enjoy all your reviews and keep forward to more reviews that your going to post what’s your next shoe to review? I’m on it! The good old scoreboard is making the comeback. At the moment, I’m testing the Kobe NXT 360, so it’s gonna be my next post. Looking forward to see your thoughts below once it goes live!